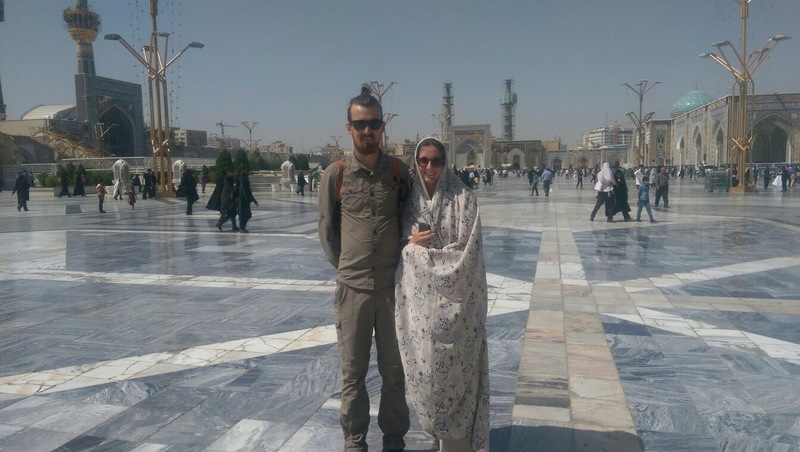 Iranian hospitality is world famous and our warm showers app is a good indicator of this. Despite the practice being illegal in Iran, there ﻿are probably more warm shower (not to mention couch surfing) hosts registered in Iran than there are in all of the countries we’ve been to so far put together. Many of the hosts aren’t even cyclists! Just normal families who want to meet people from different cultures. 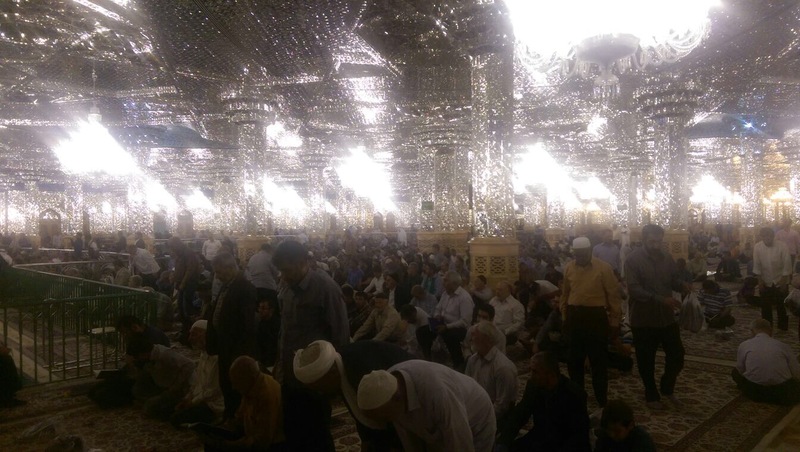 There are 76 hosts in Mashhad alone. We had organised to stay with a family in the west of city so that’s where we headed when we disembarked off our coach. We had our first taste of Iranian drivers (who are notoriously bad) but Paddy steered us through the centre beautifully. If possible, tandem gets even more attention than usual here and we’re flooded with photo requests as soon as we stop to check the map. Our warm showers host, Mohammed and his lovely wife Zena, couldn’t have made us feel anymore welcome and we really enjoyed hearing all about Mohammed’s new start up business which will offer a digital selling platform for Saffron farmers in Iran. Him and Zena are awaiting on their visa application to move to Amsterdam so we met them at a really interesting time. Iran grows more than 90% of the worlds saffron! 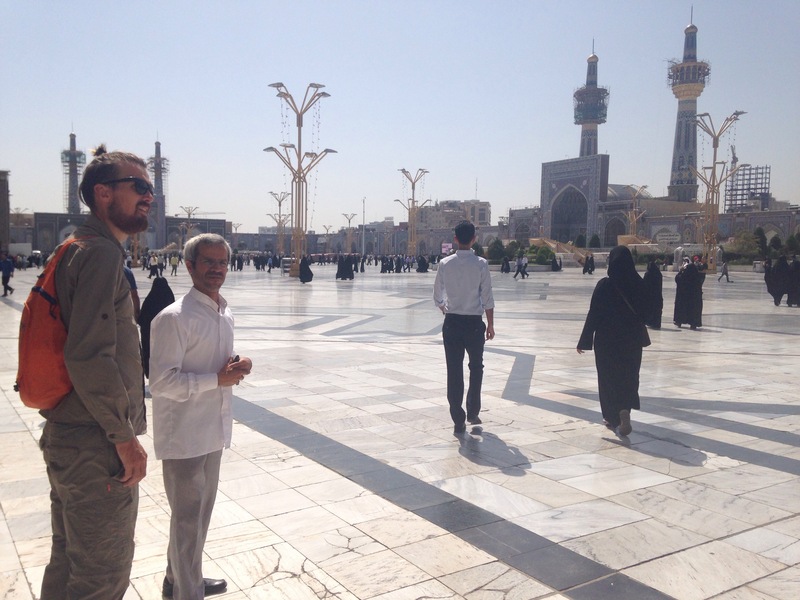 We planned to have just one full day in Mashhad to visit the city’s main tourist draw; Harem-e-Rezavi or the shrine of Reza who Shia Muslims believe was the 8th Imam (rightful spiritual leader) after the death of the prophet Mohammed (there are 12 Imams in total). 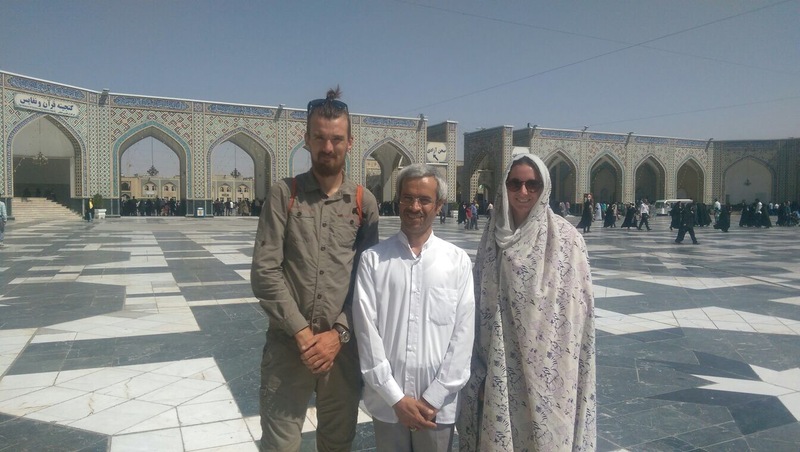 Reza is the only Imam buried in Iran and the site is considered one of the most holiest places for Muslim pilgrims, particularly for Shia Muslims but Sunni Muslims also visit. The building of the shrine site was started in the 14th century and has been growing ever since. Buildings are simply bulldozed down to make way for new expansions every year. The site can currently hold a whopping 7 million people. Mecca only holds between 2-3 million and unlike the latter there has never been any incidents or injuries due to poor crowd control here. Both sexes are required to dress conservatively and women must wear a chador on site. Luckily I was able to borrow a thin 100% cotton one from Zena. Here we are in the large square. The chador is essentially a large piece of material (black usually but not always) which is wrapped around the head to cover the full body and is held in place with your hands or wrapped around the arms. Chador literally means ‘tent’ in the Persian language of Farsi. 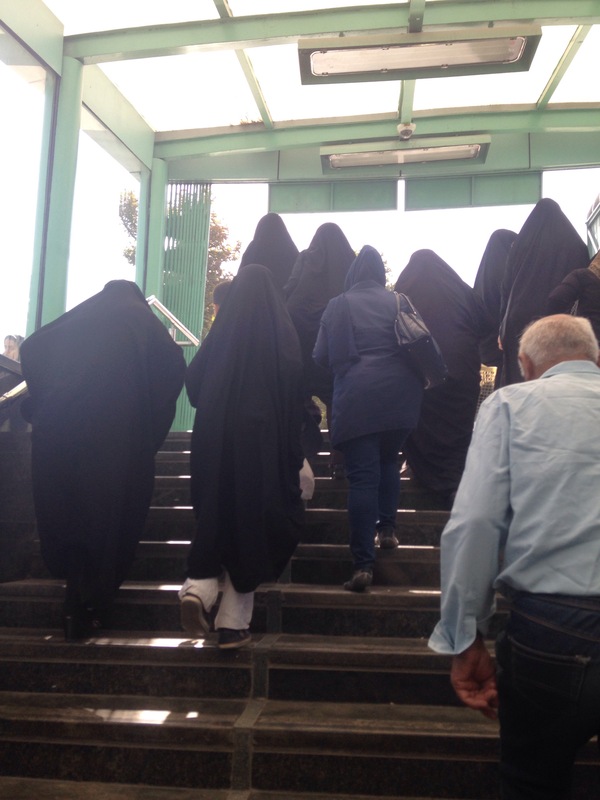 Other than holy sites, it is now not a requirement for women to wear the chador but many still choose to. 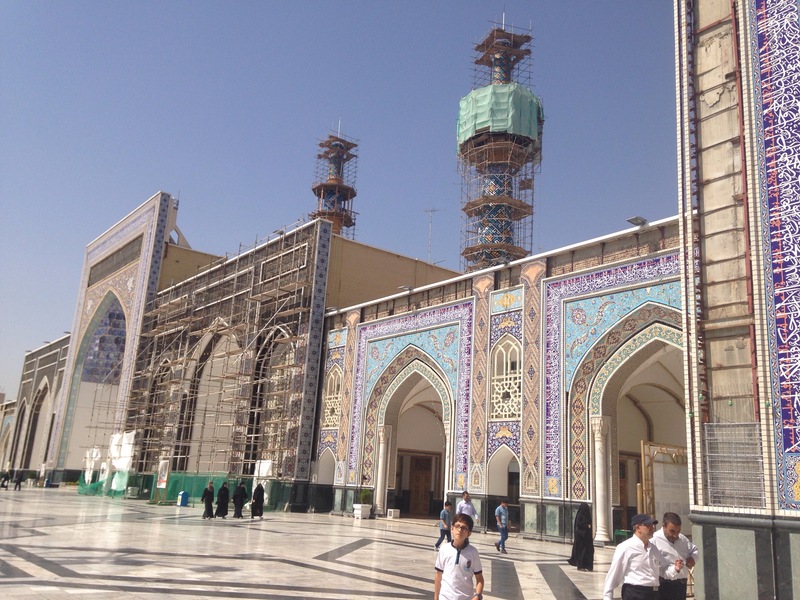 It’s more common in holy cities such as Mashhad and more provincial towns than in Tehran, Esfahan or Shiraz. When you’re not used to it, it can get very hot under there!!! Non-Muslim tourists are strongly encouraged (not much choice in the matter) to have a guide in the shrine complex. Entry is completely free and all the English speaking guides are volunteers. Our guide was called Ali and despite him being a little zealous about his faith at the beginning it really was great having him and we were able to ask lots of questions. Mashhad means ‘place of Martyrdom’. It’s difficult to understand the national psyche of Iran without first understanding the importance that martyrdom plays. Naturally, the Shiite faith plays its part in this aspect of Iranian culture. For example, the three Imams who are most revered are the ones who were also brutally murdered, and at holy sites it is not unusual to see pilgrims showing heartfelt outpourings of grief for their suffering. When Ali was telling us the story of Hossain the third Imam his eyes filled with genuine tears. During the Iran-Iraq war many men (and boys as young as 13) sacrificed their lives in the name of their country by clearing mine fields by walking through them. Many of these martyrs are still remembered and held in great esteem today, and in every town and city across the country you will see painted murals and road side posters of their faces. But to say that the Iranian ‘martyrdom fever’ is simply a bi-product of religious fanaticism would be missing an important subtlety, and the genuine importance placed on ‘putting others first’ is fuelled by social and cultural etiquette just as much as religious teachings. 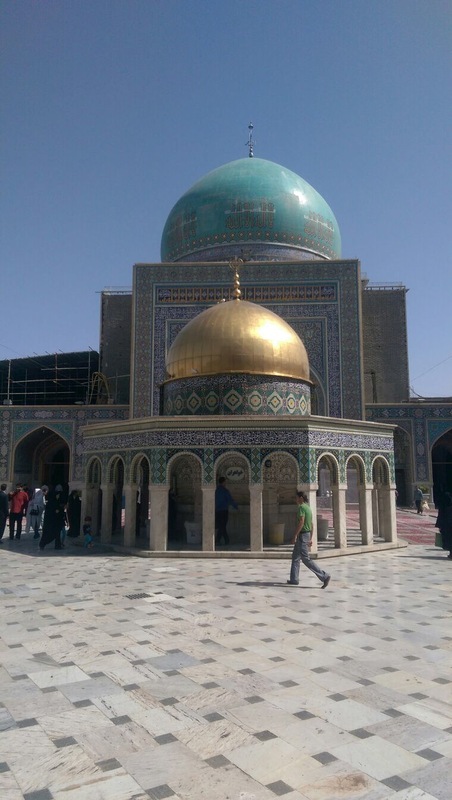 Ali took us on a walking tour of the site and explained some interesting features of the architecture which include a turquoise domed mosque from the timurid period and some very impressive tiled ceilings which were only completed quite recently. Surrounding the main buildings are a number of large squares with water features in the middle. Large red Persian rugs get laid down during prayer time. Before heading over to the site’s museum, Paddy was lucky enough to be taken down into the main prayer room – a huge cavernous underground space who’s walls and ceiling are covered with mirror shards. Huge chandeliers hang from the ceiling. Unfortunately I wasn’t allowed in but Ali told us that the purpose of the broken mirrors was to help pilgrims to forget their individual needs and wants and focus on their message to Allah. 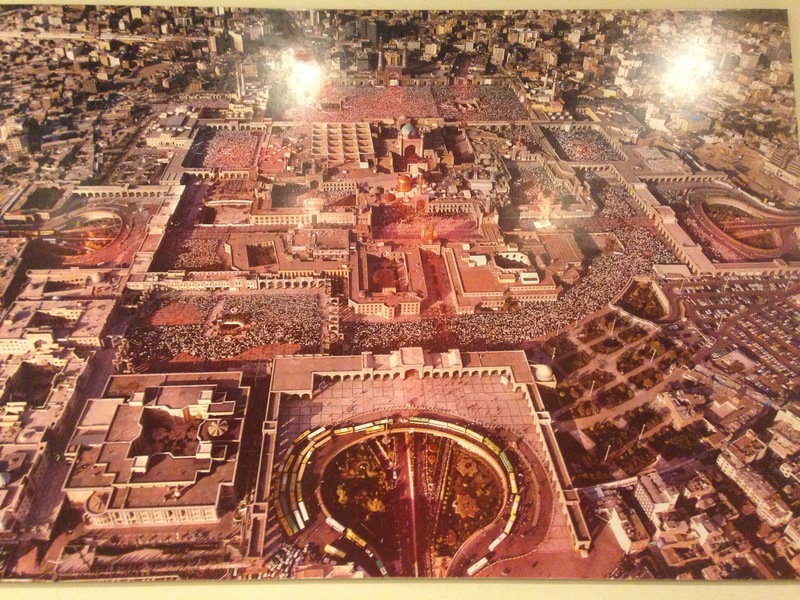 Coming to the site was a really interesting experience and the site is just as important for Muslim pilgrims now as it was 800 years ago which, made it a fascinating place to people watch. Our next stop is the town of Yazd and to get there we will need to take a 16hour overnight bus ride across the desert.